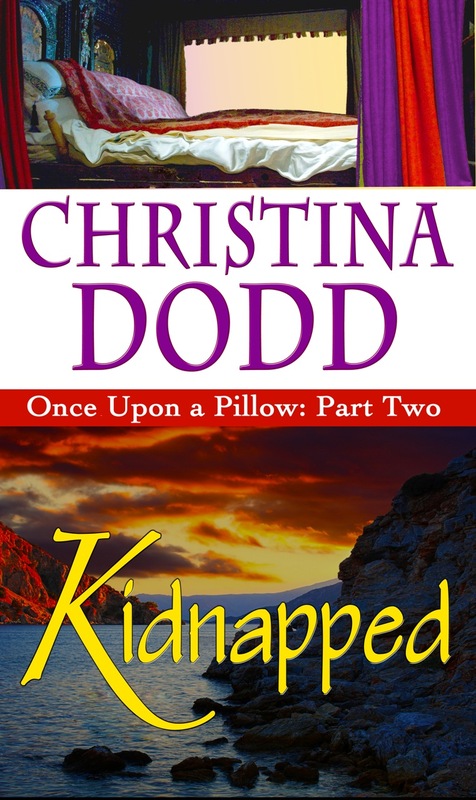 New York Times bestseller Christina Dodd brings you her fabulous and funny romance novella, KIDNAPPED, book two of ONCE UPON A PILLOW, the daring saga of a magnificent bed and the lovers who have shared it through the ages. KIDNAPPED is a historical romance novella of approximately 100 pages, and part of the anthology ONCE UPON A PILLOW written with author Connie Brockway. LAST NIGHT is my other novella in the collection. KIDNAPPED is available now for Kindle, Nook, Kobo, and iTunes! Once upon a time, my husband had a brilliant idea for an anthology, about a bed from the time of its construction in Medieval England until the present when it resides in a museum. I told my friend, bestselling historical romance writer Connie Brockway, and she recognizes genius when she sees it. (This is my husband’s theory, anyway.) Connie made me swear I would let her in on the project. It took five long years, but at last we published the four stories as ONCE UPON A PILLOW, a collection of four novellas about the historic Masterson bed and the passionate lovers who have shared it through the ages. And now, for the first time ever, the novellas are published in eBook! Not until her kidnapping did Lady Helwin realize how badly security in Trecombe had disintegrated. When she heard the hoof beats galloping down the beach toward her, she turned — and smiled. Any woman who appreciated masculine beauty would have smiled. The beach stretched on in a smooth, unbroken line of silver sand and sheer cliffs, the wind blew off the sea, and Rion Masterson rode like a centaur, black cape and raven hair flying behind him, eyes glittering in the late afternoon sun, pleasure in the exhilarating ride emanating from every line of his fine form. A handsome figure of a man, an adventurer who had gone abroad to seek his fortune — and failed miserably. Now he sought prosperity closer to home, and Helwin wanted to wish him luck — sarcastically, of course. She’d observed the newly returned nobleman many a time as he visited her uncle’s house. She’d admired his grace, his wit, the skillful way he used his green eyes to tempt and seduce – not her, but her cousin Bertilda. She could have told him Bertilda might relish a dalliance with the dangerous lord of Castle Masterson, but Bertilda vetted her suitors’ finances with the cool eye of a cutpurse. But Helwin could tell Rion nothing. She was not permitted to show her face to visitors. Out of sight, out of mind, had been Uncle Carroll’s philosophy about Helwin, and thus far it seemed to be working. Except for the occasional careless inquiry from one of her father’s old friends, no one cared about Helwin’s fate. Helwin might as well resign herself to living out her life as a lonely spinster in her uncle’s household. But she could still enjoy a solitary walk on the beach, and she did thrill to the sight of handsome, daring Rion Masterson riding toward her … right toward her. Right at her, although surely by now he’d seen her. She tried to move out of his path. He swerved as if to follow her. She waved her arms to call attention to herself. He laughed, an open-mouthed, merry laugh that frightened her in its intensity. Why was he riding at her so determinedly? Was he the kind of man who found pleasure in running down a helpless woman? Or had someone — Uncle Carroll, even Bertilda — told him she would be here and offered him a reward for eliminating that annoying remembrance of former days? Helwin caught her breath. Her heart skipped a beat, then leaped into a pounding frenzy. Bertilda. That witch Bertilda had insisted Helwin go for a late afternoon walk. She had insisted Helwin wear her purple velvet cape. Bertilda had set her up. Helwin fled, swerving to reach the boulders scattered at the bottom of the cliff. If she could make it that far, Rion wouldn’t dare ride his precious war horse through the rubble and take a chance of laming him. She could make it. Surely she could make it. The stallion thundered behind her. She could almost feel its hot breath on her neck. But she was safe … almost there … when the horse charged past her. She had only a moment of optimism, a bleak hope that Rion would ride on when, with one strong arm below her ribs, he scooped her up. She opened her mouth to scream, but in a single smooth movement, he brought her up and over, flinging her face-down before him on the horse. The wind rushed out of her lungs, and she gasped, trying to get air.